Sooo this is another relatively cop-out post… The ants swarmed, our apartment was covered in ant killing chemicals and I am full of guilt for killing ants, and my lovely cousin asked to visit (which as been amazing! ), and as a result of all of this I spent today cleaning things and hanging out with my cousin and his adorable cats and extremely cuddle-able basset hound. All good things, though none are conducive for catching up on work, let alone getting ahead. Oh well. So! Here is an portrait of a lady with very curly hair that I recently completed that I am very fond of. It’s for sale in my other shop, Lace and Sparrow; according to Pantone’s Summer 2011 Color Forecasting Trend Report Thingy, Ember Glow Coral is supposed to be a hot, trendy color and it is totally coincidentally almost the same color as the red-orange-coral-whatever-you-call-that-colored design in this portrait. So there’s that. I actually started out with a totally different idea of what this illustration was going to look like, and got this portrait instead as a happy accident while moving layers around in Photoshop. Also: Hello new visitors? I do not know where you are coming from, but welcome! I hope you enjoy your visit. You can read a bit about me on my About Kira Scarlet and Scarlet Tentacle page, and you can see some of my artwork at my Scarlet Tentacle Etsy shop. Please do say hello if you’d fancy. If life does not throw any more invasions of bugs at me and I still have use of my hands and wrists after derby practice tomorrow, there will be more posts over the rest of the weekend! Hooray! 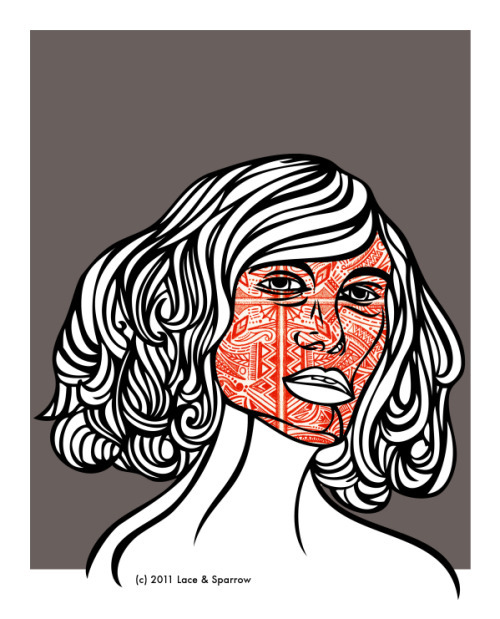 This entry was posted in illustration and tagged bust, female portrait, illustration, kira scarlet, lace and sparrow, portrait, scarlet tentacle, vector graphic. Bookmark the permalink.